Terror attacks can have similar devastating effects on traditional methods of communicating. Command and control, situation awareness and humanitarian assistance and disaster relief can be seriously impaired if reliable communications are not available. With traditional systems that are normally relied upon by first responders down, a reliable and easily implemented, satellite communications (SATCOM) network comes in to its own. In many cases, SATCOM has been the only source of reliable communication for the hours, days, weeks and months after a disaster. 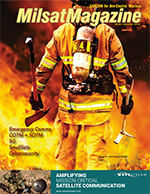 All First Responders have their own communications systems that are designed to be robust in times of crisis; however, these systems are typically based upon terrestrial infrastructure. If the infrastructure is not available due to the crisis being in a remote area, or because the infrastructure has deteriorated because of severe weather, terrorist attack or network congestion,) then the ability to communicate is severely restricted or non-existant. To ensure the necessary information is received by the correct personnel is much harder to accomplish when circumstances have interfered with communications — responders must have in their possession the correct equipment that would allow them to communicate effectively, no matter the situation surrounding them. 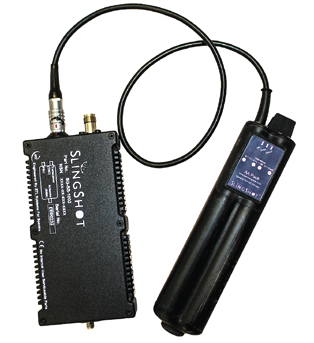 SlingShot offers a natural enhancement to any First Response communications capability. The product provides range extension from normal terrestrial based systems via connection to the Inmarsat Satellite I4 constellation (called L-TAC). SlingShot is low SWaP (size, weight and power), that is able to provision the personnel, vehicles, boats or aircraft (fixed and rotary). The system connects directly to the current radio used by the First Responder — that results in minimal training time or any cognitive burden to the user. SlingShot can be used from any 12 – 230v power source, using the Responders own power system or any number of secondary power sources. SlingShot provides critical voice and data services — this means that when the Responder presses the pressel on the radio, a channel is provided instantly and all communications is transmitted to all on the network. This is different to many range extension systems which provide either an on demand channel, (i.e., one is provided if a channel is available and not guaranteed), or Voice over IP (VoIP)/Radio Over IP (RoIP) where there is no guarantee of the IP network providing the circuit when needed and, therefore, no guarantee of the delivery of the actual message. Where the Responders radio system is able to transmit data, SlingShot will support this, meaning that the First Responder remains able to share critical data. SlingShot provides a collaborative network for interoperability. 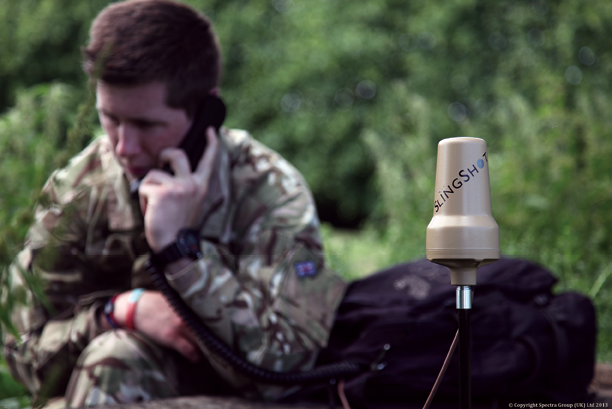 Where First Response Agencies may have differing radio network systems which normally do not communicate directly together, SlingShot enables differing types of radio systems to work together on the same net. The SlingShot system does not have to be provided to each and every First Responder, only key elements would require the capability, therefore, there is not a massive hardware cost. The L-TAC network can be leased daily, weekly, monthly or yearly, as the situation requires, allowing budgets to be managed effectively. When compared to the cost of keeping key infrastructure in remote locations or other range extension capabilities such as air platforms, L-TAC is less expensive. What does this mean for the First Response community? The ability to respond to any crisis, anywhere, and not having to rely on the normal communications network that is working in the crisis location, means being able to share information using voice and data with their main HQ, interoperability with other Response Agencies, resulting in true collaboration. Being able to use the radio system already in service means no additional training burden. Author Simon Davies is the Chief Executive Officer of Spectra Group and a Senior Contributor for MilsatMagazine. Spectra Group (UK) Ltd is a world leading solutions provider of high grade information security and communication capabilities with a proven record of accomplishment. The company has more than 15 years of experience in delivering solutions for governments around the globe to elite militaries and private enterprises of all sizes. As a dynamic, agile, security accredited organisation, Spectra can leverage this experience to deliver Cyber Advisory and secure Hosted and Managed Solutions on time, to spec and on budget, ensuring compliance with industry standards and best practices.